Home » WOD Blog » Weekend Update! Set 2: 1 Back Squat every 30 seconds for 1:30 @ 90% (4 total reps) – DO NOT re-rack the barbell until all 4 reps are completed. Notes: These are LOW bar Back Squats, but the percentage is based off of your 1RM HIGH Bar back squat. Practice un-racking and holding the bar on your load up sets. 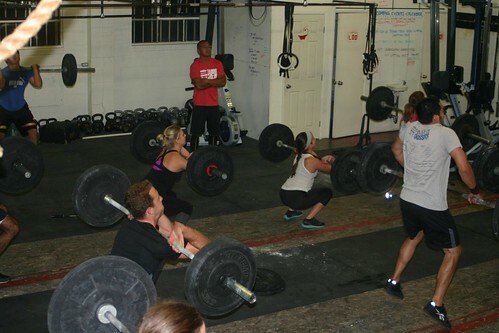 If this is logistically not doable for larger classes, we will perform 2 Back Squats on the minute for 10 minutes. *May scale the number of reps for each movement to keep intensity high for 7 minutes! **May substitute with 2oo meter sprint and regular or hand-release push-ups. So, we’ve decided to stay a while. As we’ve come to terms with this fact of life, it’s now time to seal our fate (literally). You guessed it, we are re-doing the gym floor! Beginning Friday evening, December 7, it will be like Santa’s little workshop in here with our buff little elves gluing, painting, sealing and re-fitting a little piece of PCF history (The wood is from our first gym and used to have all of our PR’s written on them, btw). What this means is, “SLAMMING BARS” will be suspended for the entire weekend. Put another way, the gym will be closed. This is why every one of you should join us for the Santa Monica-Venice Christmas Run. This is one of the biggest and most popular holiday running events with a 5K, 10K, 15K (you can sign up for both if you’re in to that), and it’s also a costume-optional event! Let’s all seize this opportunity to promote PCF in our new hood galavanting through the streets as the hobos cheer us on! Please RSVP and check out all the details in the Upcoming Events page. Diso envisions Santa and some reindeer….anyone? anyone?